December break is a good time to rest a little from wrestling with college application essays. You are probably saying, “Is she kidding? I have to email those essays right away.” Fortunately, some colleges have a February 1 deadline, giving you more time to consider what you have written and make final edits. But don’t do that – at least right away. Instead, print the essays out, and put them in the drawer. Have fun with your friends, family, and relatives doing whatever. In a few days, take them out, and read them out loud to a family member. You will find that grammar mistakes, missing content, or content in the wrong place will become apparent. Give your essays the test of time. I tell students to give their essays “the test of time”. Before sending them out, put them in a drawer and take them out a few days later. Read them to parents, family members – OUT LOUD. You would be amazed at how many mistakes you will find – grammar, spelling. You will also find that you should add information, might need to move paragraphs around. Your essay should be perfect. This is important. Many times someone like myself, an essay editor, can catch mistakes that you don’t see. For more information about my services, please email me at Debby@academicsupportlink.com. How Much Guidance Does a Student Need To Write an Essay? One of my students just finished her first supplemental school essay. (In case you don’t know this, colleges/universities may or may not require applicants to write one or more essays. You’re thinking – do I have to write these if they’re not required? The answer is YES! You are competing against over 2 million other applicants who will take the time to write them. The supplements are in addition to the longer, personal statement on the Common Application or Universal Application.) She needed a lot of guidance. After meeting her and helping her focus on what elements should go into the essay, she wrote a first draft. I edited it and sent it back. However, this student required continual support through the process. The end result was an essay that will get noticed in the admissions office. Bottom line: The type of writing students have to do on the personal statement and supplement questions is a bit different than in-class assignments. Students have to talk about themselves – their interests and experience. This is sometimes difficult for students. So, yes, some teens need more help. As applications deadlines approach and I’m working with students on their essays, I’m hearing some worries about getting the essays completed in time and in tip-top shape. They are thinking, “Am I saying what admissions officers want to hear?” “Will they read my essay and decide I should be in the freshman class?” I advise students to speak from the heart – writing about their passions and interests will lead them to write a unique story. That’s an essay that admissions officers want to read. Willing To Put in the Effort Required on College Essays? Last night’s talk on college app essay writing was a success! Thirty-three interested Newton, Mass. parents and students learned how to pick a prompt, decide about a topic, write drafts of essays, and make final edits. Does that sound like a lot of work? It is but, fortunately, students learn the skills involved in writing essays in their high school English classes. They, however, have to make time to do the writing. With extracurricular activities, homework, volunteer efforts, and part-time jobs – when do they have time? Starting earlier in the process is a help – the summer before senior year. Use a calendar to mark dates work is due and plan it out. An Excel sheet is a great help to keep track of essays you must write. Take one day at a time. Get each step in the process done a little every day, and you’ll get the essay completed. Shows your writing style and English language use. Gives a personal, human element to the app. Explains an issue: a change in school, improved grades. Can’t make up for poor grades, low GPA. Isn’t a substitute for high SAT or ACT scores. Apparently, tweeting and posting are important skills. There is a downside: If you can’t hit a homerun in this tiny response, you may not get into college – frightening thought. Why would schools want brevity? One reason is the massive numbers of students applying to U.S. schools – over 2 million. Obviously, college admissions officers are just plain exhausted from the vast amount of essays they have to read. One officer told me that she reads 865 essays a year, and this is a small school. Word of advice to officers. Every college-bound student deserves a moment in the sun; let them show you what they are made of by writing their hearts out. You need to get started on your essays, dear. You really need to make time for this. You said that you would get to them today! You’ll never finish the essays on time! 1. Begin the process early – summer before the senior year is preferable. 2. Make sure your teen understands what’s required – think up an idea, write drafts of the essay, final edits. 3. Decide on deadlines for getting the work done with your child, then write these on a calendar. 4. Understand her stresses – schoolwork, extracurricular activities, volunteering, and maybe a job. 5. Arrange regular 10 “meetings” – in the car, for coffee – to check in on his progress (or lack of). 6. Be flexible: Alter deadlines, if needed. Tests, papers for school may be due – you don’t want an overload problem. 7. Get organized: Use an Excel sheet to write down what essays are required for which schools. 8. 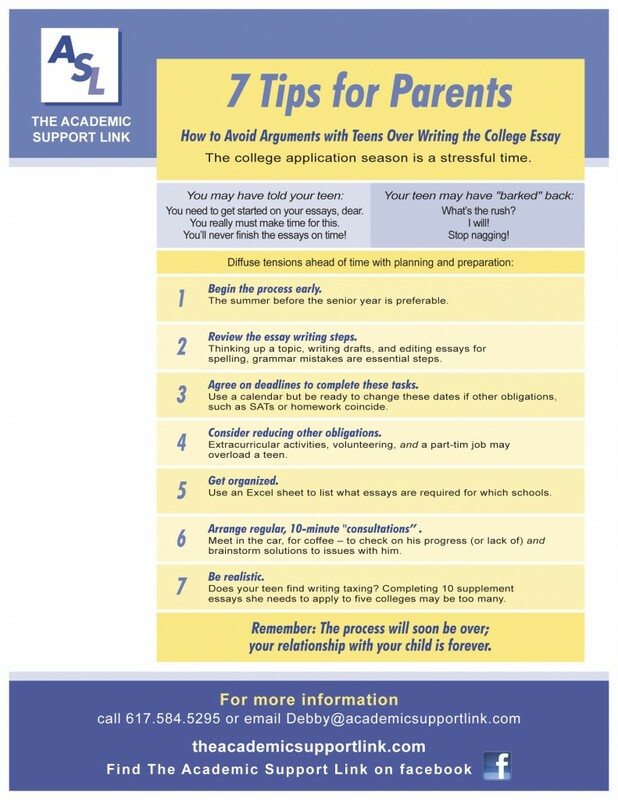 Be realistic: If writing is a task your child finds taxing, completing the 10 supplement essays needed to apply to 5 colleges may be too stressful – and require a reassessment of goals. 9. Have patience: The process will soon be over; your relationships with your child is forever. 1. Think about realistic deadlines, hopefully, earlier in the fall semester before you get busy in school. Discuss these with your parents. 2. Use a calendar to write down information – early acceptance, early action, and regular deadlines. 5. Leave enough time to think up an essay idea, create a first draft, write a second draft, and do final edits (yes, you need to all that work before you essay is in tip top shape – you want to make an impression on admissions officers, don’t you?). 4. If you can’t complete work on agreed-upon deadlines, let your parents know why and then set new goals. Remember, your family wants the best for you. Which Essay Should I Choose? “Celebrate your nerdy side” (a supplement question). Advantages: An opportunity to “plead your case”, show your “stuff”. Disadvantages: It’s difficult to talk about yourself. You may sound too distant. Advantages: Has a focus, can show off your talents. Disadvantages: Writing without being well informed – get your facts right! Advantages: Has a focus, you know why you want to go there. Disadvantages: You might not know the school or the curriculum thoroughly enough. How Am I Going to Write All Those Essays? I’m often asked by students how they will possibly complete all those essay. After all, there is the personal statement and anywhere from one to five supplement questions for each college. There is no doubt that this is an enormous task. However, many of the essays are similar. For example, most colleges ask “Why _” – your reasons for applying. If you think about it, you have researched the college, so you found something that attracted you to it. Liking the dorms, the “environment”, or because a friend attended are not reasons. Connect your interests/classes you’ve had in high school to the programs/majors at your college of choice. So start by writing down all the essays and find the ones that have similar topics and begin writing those. Twitter is one of the most popular and cost-effective marketing platforms. Not using Twitter to market your business? You’re missing out on tremendous traffic and potential sales. 1. It’s the tenth most visited website online. You can attract targeted traffic from this site alone. 2. There are currently over 200 million users, generating millions of tweets per day. 3. It has become one of the most popular, most cost-effective marketing tools around. 4. Creating a lot of Twitter backlinks helps to increase your rankings, since Google added these social media sites to their algorithm and use them in their rankings. 5. Everyone is there including your target market. Join them! I’m often asked by students how to write a standout essay – what does it take? My answer is that you need to feel excited – passionate – about the topic of your essay. That’s why it has to come from your own experiences. Bottom line – you can’t make this up. It can be a grade you never thought you’d get, a compliment you received from a boss, a race you ran and got your best time, etc. Not all of us can be president of the class or editor in chief. Be yourself, describe what the experience meant to you, focus on one event (not your whole summer vacation), and think about what you learned. Good luck. Your deadlines are approaching to apply for early action or early acceptance. You are nervous and even panicked about getting your essay finished on time. Stop right there! Take a deep breath and know that you can do this. If you have a rough draft, ask someone to read it – a family member, teacher, coach. Ask them for constructive criticism. Do you need to narrow your topic, add more detail, make the introduction stronger, etc? Make the changes/additions. Now put it away for a day or two. You need the test of time. Take it out a few days later, and read it out loud. How does it sound? If there are “issues”, you will be able to find them this way. You can do it! • Don’t write on a topic no one knows. You are the only original topic, so your primary goal is to let colleges know what you care about and why. • Don’t go over 500 words. You are showing that you can’t follow instructions. Also admissions counselors have limited time to read your essay. • Make sure that you answer the question – stick to the topic. • Use your own voice. Don’t look words up in a dictionary and use them. 1. Write down all possible ideas – experiences, challenges, etc. 2. Set a timer – 10 min. or so. 3. Don’t stop writing to reread. 3. Add descriptive words about your strengths. 4. Ask your parents/family members to try this too. If there is an overlapping experience, then this is the one you should write about. Pick one moment in this experience and describe it. Write your essay about an experience that you’re passionate about. A best friend moves away. A person you look up to. Focus on one day or one encounter. Give proof – describe this experience in detail. Show off your talents: Can you see it, hear it, touch it?